Bega Valley Shire Council has adopted a procedure designed to reduce smoke pollution in the Shire. Council’s Environmental Health Coordinator, Greg O’Donnell, said that a clean air procedure will reduce the impact of open burning in the Bega Valley Shire, with the view to protecting local air quality, local amenity, and human health. “Backyard burning in incinerators or open piles and burning vegetation on properties near adjoining residences can unnecessarily expose the community to health risks and nuisances associated with smoke and contribute to a reduction in air quality,” Mr O’Donnell said. With Council’s listing under the Protection of the Environment Operations (Clear Air) Regulation 2010, environmental approval from Council is now required for all Shire residents wishing to undertake open burning of vegetation at any time throughout the year. “Generally, residents wanting to burn vegetation that is located more than 75 metres from a neighbouring habitable building such as a house do not need to get any additional approval from Council provided they meet the requirements set out in the procedure. “Residents wishing to burn vegetation located less than 75 metres from a neighbouring habitable building will, however, need to obtain a specific (fee free) approval from Council. “The requirement to obtain an environmental approval for open burning will improve local air quality conditions and reduce the need to investigate along with the cost for local fire services to extinguish nuisance fires. Superintendent with NSW Rural Fire Service, John Cullen said it has been a long held requirement that persons undertaking any burning must always give at least 24 hours notification to their neighbours and their relevant local fire service of their intention to burn. “During the declared Bushfire Danger period, generally 1 September to 31 March, fire permits are also required from the relevant local Fire Authority either the NSW Rural Fire Service or Fire & Rescue NSW, prior to anyone undertaking open burning,” he said. Mr O’Donnell said that residents operating wood heaters and BBQs are not affected by the introduction of this procedure. Copies of the Clean Air Procedure and application forms can be accessed online at www.begavalley.nsw.gov.au or by contacting Council’s Environmental Health Coordinator on 02 64992483. A review of the procedure will be conducted by November 2017. 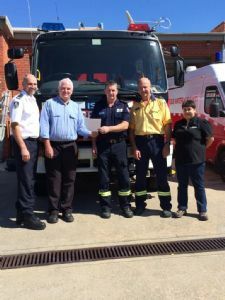 Photograph: The Rural Fire Service’s Martin Webster and Garry Cooper (far left and second from right) and Rick Dawson (centre) from Fire and Rescue NSW with Council’s Greg O’Donnell and Amanda McKenna.